RadGanttViewElement is the main element contained in the control. It parents the two main elements that you can see in RadGanttView and the separator between them. GanttViewTextViewElement is a virtualized stack container which holds the columns of the text view and the items in it. GanttViewTextItemElement represents a single row in the text view. GanttViewTextViewCellElement is a cell element which displays data from the data item. 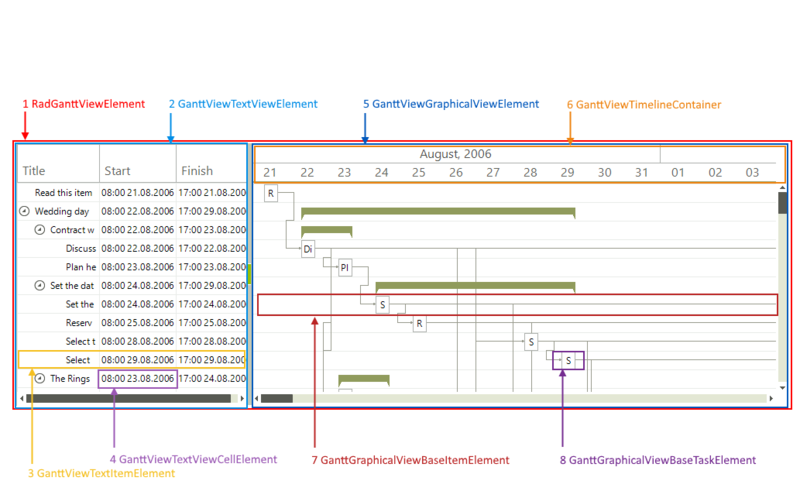 GanttViewGraphicalViewElement is a virtualized stack container which holds the timeline container, the items graphically visualizing the gantt data and the links connecting different tasks. GanttViewTimelineContainer is a virtualized stack container which holds items displaying time. GanttGraphicalViewBaseTaskElement is the base type for the task elements.